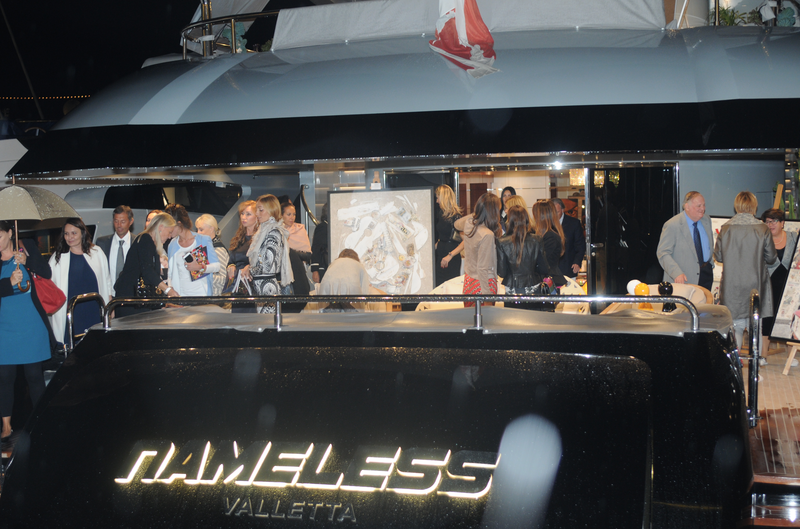 In spite of the inclement weather that devastated the Maritime Alps last weekend, Sandrine Garbagnati-Knoell organised the exhibition of the works by two contemporary artists from Italy and Spain, while launching her new company ArtSGK 55, on board the yacht Nameless docked outside the Yacht Club of Monaco. The paintings were then exhibited at the YCM from October 1 to 4, 2015. Sandrine, who is well known in the Principality for organizing top social events, is now venturing into the world of art after having participated in several courses in the Sotheby’s Institute of Art. Gianni Ottaviani is an Italian painter who has been inspired by American artists and with deep knowledge of the world of pop art. In his works there are influences from Rotella, Arman, Rauschenberg and the New-Realism. His paintings that are three-dimensional and colorful resemble more like photos. He is also a talented portraitist and among his works we can mention those of: Diego Abatantuono, Veronia Berlusconi, Pope Wojtyla, Princess Diana, George Weah, brothers Diego and Andrea Dalla Valle, as well as portraits of professional players, the likes of Andrei Chavtchenko and celebrities in different fields, the latest being beautiful actress Monica Bellucci. His works have been exhibited in Rome, Pescara, Milan, Paris, Berlin, New York and Toronto. Julian Calatrava is a Spanish artist whose works belong to a personal figurative art. He uses graphical colorful materials that he puts at the service of the human figure that is at the core of his thematic. This makes us meditate on the human being as individual and also part of the gearing of the social network. He tackles this theme by means of caricature and cartoons language, making it accessible to the audience. Fluid in trace and gesture, the work breaks the form down to its elementary parts, with outlined plains and volumes, where color, matter, composition and line conjugate this particular language. Calatrava manages to create an urban art that mirrors the exceptional vis-à-vis the daily life, where the characters interact in a silent scenario, fluctuating between dream and reality. A world filled with day-to-day elements, which are used as narrative to build up the visual experience.